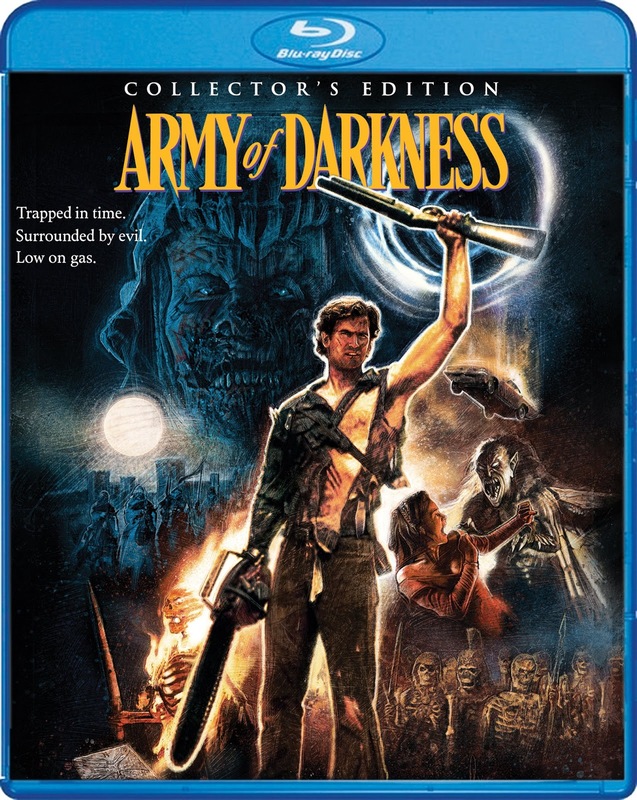 Rupert Pupkin Speaks: Scream Factory - ARMY OF DARKNESS on Blu-ray (Collector's Edition) ""
EVIL DEAD II was one of those remarkably impactful movies for me in high school. I remember watching it over at my best friend's house one night and not knowing how to feel about it. The tone was strange to me in that I couldn't get a handle on whether or not I was supposed to laugh or be scared. I opted for scared, but when the scene of Bruce Campbell's hand attacking him came on I couldn't help but snicker. It was a mesmerizing experience and it was made all the more alluring by the fact that we had borrowed the movie from my best friend's older brother. His brother was really into some cool stuff at the time and I'd never have seen that film or A CLOCKWORK ORANGE without his awesome collection of movies on VHS tapes. EVIL DEAD II though was thing that really stuck with me for a while afterward. I hadn't really seen anything like it and I was just coming to realize that that was one of the remarkable aspects of cult movies in general. I wasn't aware of cult movies at that time really. I had seen a few, but none that had twisted my brain around like EVIL DEAD II or CLOCKWORK had. When I would later read about the cult movie phenomenon in Danny Peary's books, it all clicked into place. I could see exactly why Sam Raimi's oddball sensibility had grabbed a hold of me and dug out a place in my memory forever. So as much as I was a Raimi fan by 1992, I somehow missed ARMY OF DARKNESS altogether and caught it a few laters on VHS. It was an absolute delight to me at the time as it veered even further into comedy than EVIL DEAD II had. Bruce Campbell's Ash character was even more over the top and dumb and arrogant and I loved every minute of it. It seemed impossible for anyone to watch that movie and not come out quoting at least one or two of Campbell's many outstanding and quippy bits of dialogue. One of my first repertory screening experiences was with ARMY OF DARKNESS actually. It was at my University and Bruce Campbell was there in person. They showed a 16mm print of ARMY and the crowd hooted and cheered their way through it. Bruce did a Q& A after the movie and it was absolutely perfect. He was as unruly as Ash himself and even declared that one of the inquires that he got was "a stupid question" and moved one. The crowd went nuts. He did a signing after and even signed my original VHS of EVIL DEAD (if I recall, he said something like, "Where'd you dig this up?" as the tape was pretty rare at the time). The whole thing was really glorious and one of my first voyages into seeing a movie with a packed auditorium full of die hard fans. The energy that you can feel in a screening like this is truly palpable and you come out of it even more in love with the film you are watching than you were before. Everyone should try to seek out screenings like this as often as they can as it is truly an elevating affair all around. 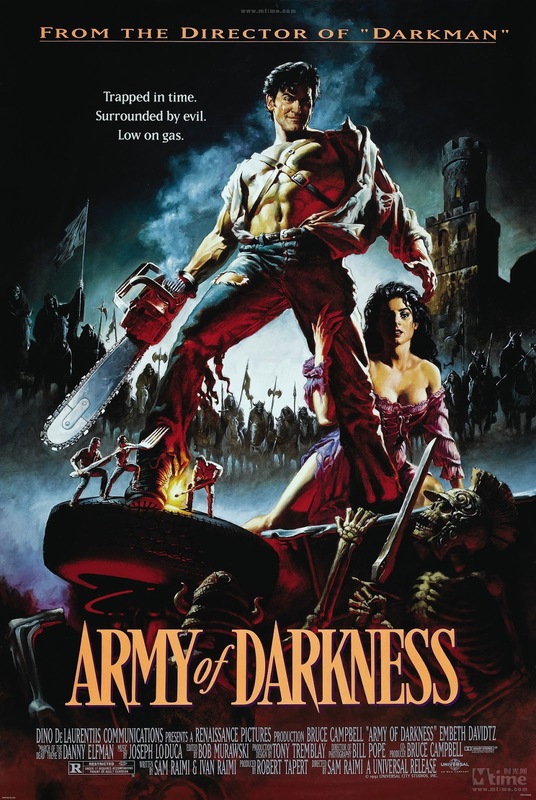 ARMY OF DARKNESS is absolutely one of those films that you can point to as defining the "cult film" aesthetic and it's easy to see why the fans are so devoted to it. ARMY holds an additionally special place in my heart also for the fact that it was one of the earliest films I shared with my son. When he was about 7 or 8 years old, we began a tradition of having a "Family Movie Night" every Friday night. It was a big deal to him, but it was just as much a fantastic thing for me. I began sharing my favorites with him and some of the first things we watched were BIG TROUBLE IN LITTLE CHINA and ARMY OF DARKNESS. It as a gamble to show him these two, because they were right on the edge of being too scary for him. I rolled the dice though and it payed of exponentially in that they became a couple of his favorites and I think not only gave me some cred with him in terms of picking movies, but also helped propel him further into a broad love of cinema in general. The EVL DEAD films are really a kind of litmus test at this point for me. It's not a make or break thing and they are certainly more widely known now than 10 years ago, but they still seem to define a certain kind of personality type that I tend to relate to. The cult of THE EVIL DEAD movies, Raimi and Bruce has really stood the test of time and only become stronger and more far reaching in the years since the movies came out. We are now obviously on the precipice of the new ASH VS. THE EVIL DEAD series coming out and old fans of the series couldn't be more excited. It seems sure that this series will also turn a lot of new fans onto the property and it seems like a no-brainer that they would want to pick this Blu-ray up. A must own for sure. I know that fans who've bought ARMY OF DARKNESS many times in previous editions and formats may be skeptical about dipping in on yet another one, but trust me this is pretty much the definitive set. This 3-disc set is loaded to the gills with supplements (some old and some new) and should please all fans of this outstanding cult comedy. -Medieval Times: The Making Of "Army Of Darkness" Featuring Interviews With Star & Co-Producer Bruce Campbell, Actors Marcus Gilbert, Ted Raimi, Timothy Quill, Richard Grove, Bill Moseley, Patricia Tallman And Angela Featherstone, Director Of Photography Bill Pope, Editor Bob Murawski, Production Designer Anthony Tremblay, Composer Joseph Lo Duca, Costume Designer Ida Gearon, Special Make-Up Effects Artists Howard Berger, Tony Gardner, Robert Kurtzman, And Greg Nicotero, Performer And Effects Artist William Bryan, Mechanical Effects Artist Gary Jones, First Assistant Director John Cameron, Visual Effects Supervisor William Mesa, and Stunt Coordinator Christopher Doyle (96 min.). -Original Opening with Optional Commentary By Sam Raimi And Bruce Campbell. -Deleted Scenes with Optional Commentary By Sam Raimi And Bruce Campbell. DISC TWO (Director's Cut – 96 min.) – 1080p High-Definition Widescreen (1.78:1), DTS-HD Master Audio 5.1 & 2.0. -Audio Commentary with Director Sam Raimi, Actor Bruce Campbell, and Co-Writer Ivan Raimi. -Additional Behind-The-Scenes Footage From KNB Effects (55 min.). -Vintage “Creating The Deadites” Featurette (21 min.). -Extended Interview Clips With Sam Raimi, Bruce Campbell, and Robert Tapert. DISC THREE (International Cut – 88 min.) – 1080p High-Definition Widescreen (1.78:1), DTS-HD Master Audio 5.1 & 2.0. -4K Scan Of The International Inter-positive. -Television Version With Additional Footage (90 min., Standard Definition (1.33:1), DTS-HD Master Audio 2.0). -Still Galleries With Rare Behind-The-Scenes Photos From Production Designer Anthony Tremblay, Visual Effects Supervisor William Mesa And Special Make-Up Effects Artists Tony Gardner, and KNB EFX, Inc. (Over 200 Stills). -Still Gallery Of Props And Rare Photos From The Collection Of Super Fan Dennis Carter Jr.
-Storyboards For Deleted Or Alternate Scenes. -Vintage “The Men Behind The Army” Featurette (19 min.). *Note - I've heard mention of a missing shot in the theatrical version of the movie and as far as I know, Scream Factory hasn't announced details of a disc replacement program yet. Guessing they will soon, but keep in mind you may have to send in that disc to them at some point.